How many times can you say, read, hear those words together before they lose all connection to common sense? What if I feel like crying? or swearing? or I'm carrying a big bag of hate? What if I'm on my death bed? What if I'm cooking? And the worst: -- what if nothing is funny? I guess that's living. We can at least make it pretty. Silly, Silly, silly. Once is enough. 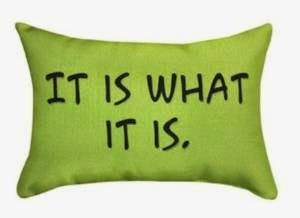 Then we hear and see too often, "It is what it is." 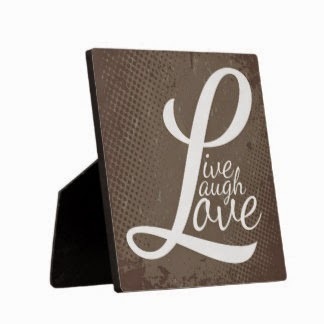 And for some reason I should buy those words carved into a 36-inch-tall piece of antiqued wood for $29.95 plus postage? Really? Yesterday I got one of those catalogs in the mail. You know the ones. Lots of pictures of things it would be fun to own. Antique or retro or sleeky new -- I look and ponder where I might put this or that. Baskets of wire and raffia, handy carts on cute red wheels, bins labeled potatoes and onions. I know I would put onions in the potato bin -- "Mary, Mary! Quite contrary." Mixing bowl sets and canisters. Geodesic hanging lights. Multicolored bottles and pale jade birds. Bistro tables and butterfly rugs. Cookie sheets and graters. Mandolines and coat racks. Hat boxes to hold everything but hats. Roosters on clocks - subtle. Remember when everything displayed a goose wearing a hat with a blue ribbon? Well, if you need a throw over your shoulders on a cool evening, I guess a garden of flowers on a green background is as good as anything, but I'll bet I paid extra for the fairies. "Life is not a journey to the grave with the intention of arriving safely in a pretty and well-preserved body. But rather, to skid in broadside, thoroughly used up, totally worn out, and loudly proclaiming . . . . WOW what a ride." From the book by Mark Frost, The Match: The Day the Game of Golf Changed Forever - a book of elegant suspense. It's a quote I like, but I don't need it on my wall. Maybe the imagined visual of the broadside skid into the presence of St. Peter makes this one so memorable. You can buy a bird feeder with carved birds sitting on it, a paisley comforter, huge angel wings to hang on the wall, triptychs of flowers, cupboards to fit behind toilets, surreal cat statues, and if you want pillows, there's a group with a smattering of these words and others -- imagine, have fun, let go, slow down, breathe, relate, hit it off, share, put your feet up. I'd get very tired doing all those things. Wreaths, sprays, vases with fake water, to hold all sorts of fake flora, arranged flamboyantly. Did you know there's no synonym for flamboyant? I looked it up, because flamboyant was a little too heavy a word for flowers, even fake ones. There's a set of dishes with 'laugh' on the bowl, 'dream' on the cup, 'love' on the dessert plate, and 'family' on the dinner plate. I didn't see any serving dishes, but I can think of a few for those -- gluttony, carbs, lo-cal. 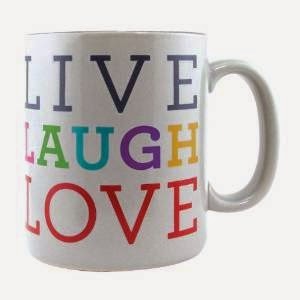 I wrote another post about labeling things, but this post is more about putting 'eye-catching' words and phrases on merchandise for sale. The t-shirt is the most obvious example, but we're all accustomed to those. I like the one that says 'I can't decide if I'm the good sister or the evil sister,' and of course UGA on everything. Amy liked to write words on things when she was a little girl, especially her name, which is still carved on the front of my piano, right below middle C. She tried to blame her brother for that one, but the evidence was there for all to see. I think he would have carved W E S. Her name was on so many other things that her denial was a hopeless endeavor and a family joke for years. Amy was a bouncer as well as a labeler, always bouncing where she sat, especially against the car seat. 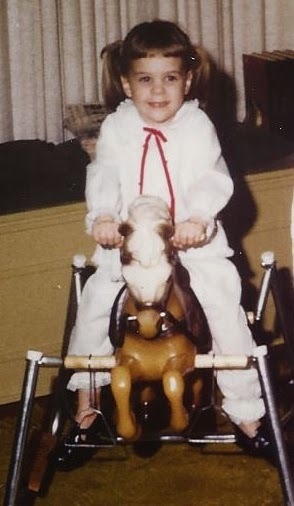 For Christmas when she was almost three years old, Santa brought her a horse, just her size, on heavy bouncing springs. 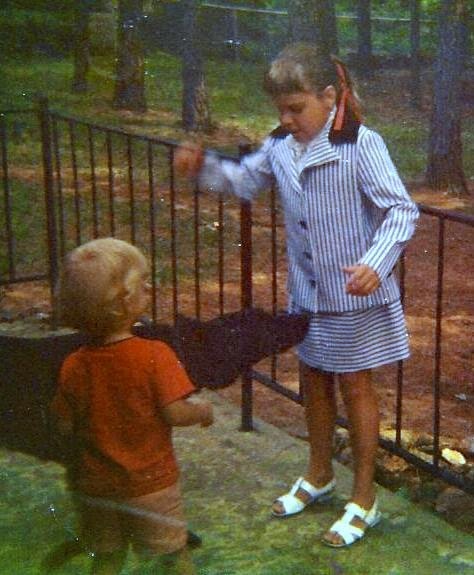 Oh, how she loved that horse. She would climb on it, and frequently fall asleep there, so I made her a pillow in a hurry, because she needed something between her head and the horse's plastic mane. It's the pillow that came to be known as her best, best pillow. Apropos of nothing, she also had a best, best cheeseburger at Add's Drug Store. I don't know why Amy liked to write on things when she was little, maybe a need to show possession. 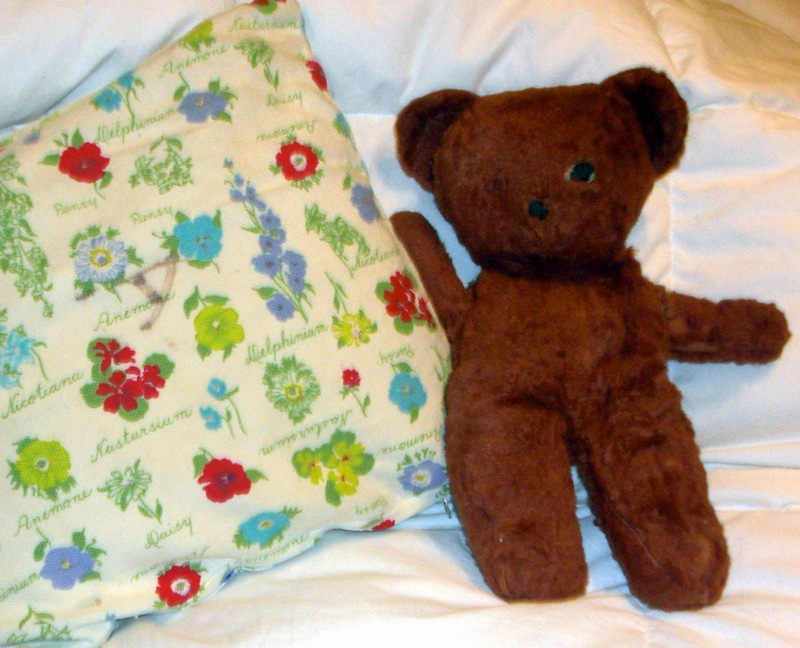 Her big sister Julie could read and write and do all those wonderful things Amy wanted to do, so she found a mislaid magic marker and wrote A M Y in the middle of the flowers on her pillow. It's faded, but you can still see the A. Every night she fell asleep on the horse with her teddy bear, Pia, in one arm, her thumb in her mouth, her head on the pillow, and her other arm holding tight to the horse. How she was able to rock while sleeping is still a mystery. We would carry her to bed. Oh, how I would love to hold her in my arms now, that warm, sweaty little body with her dark tousled curls, wet thumb, and sleepy sighs.